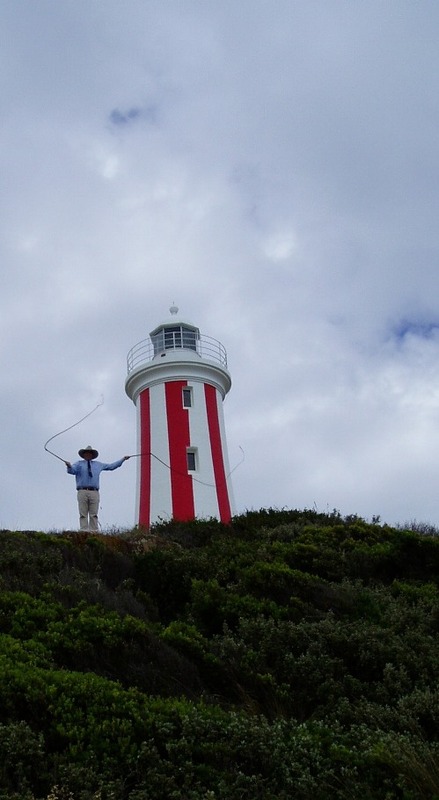 My name is Ben Hughes and I'm a 5times Australian and a WORLD Whipcracking Champion. I first met Simon in January, 2004 when he was displaying and selling his whips at a country festival. From that first time I was impressed with the workmanship, skill and care that he had obviously put into each whip. When I cracked them I was so impressed that I now solely buy Simon Martin Whips. Simon's whips are perfectly balanced and have no "buck". They fall straight which is very important, whether they are for competition, work, or recreation. I have found them perfect for performing my more technical tricks like "Ben's Helicopter" and "Tasman Crossover". Not only are Simon whips well balanced and the perfect cracking whip, they are so beautifully made that they look fantastic mounted on the wall. I couldn't more highly recommend a whip handcrafted by Simon. 2006 Australian Whipcracking Champion - 2000, 2001, 2002, 2003, and 2006 The first photo in the gallery of Ben and I in 2006. 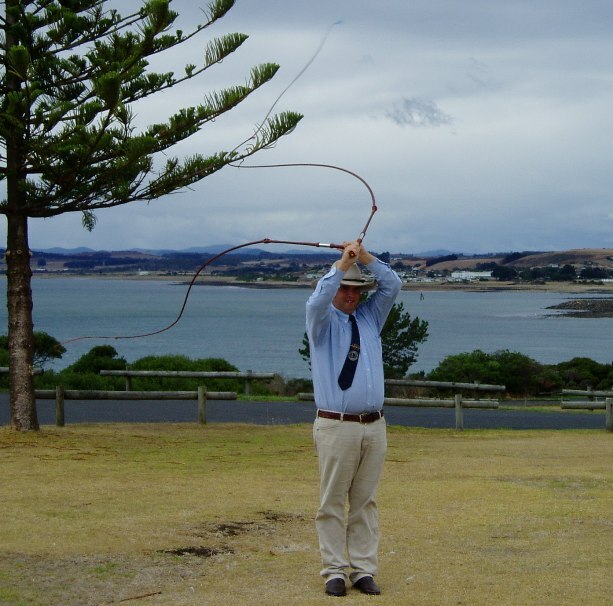 The next photos are of Ben cracking his whips in Devonport, Tasmania, Australia. I got your whips a couple of weeks ago and I'm sorry I didn't get back to you earlier but I hate to say...............I love them! They are so easy to crack. I can do some of the tricks I was having a hard time doing with the stockwhips. The workman ship is GREAT! I definitely feel honoured now to crack them. So thanks you so much!! Hopefully I get the chance to meet you someday. Well, take care and talk to you down the trail. GOD BLESS! Mate, I had just had the most wonderful surprise from Josh DeWitt last night as he handed me a beautiful set of whips to crack (in the dark) to tell him what I thought. As I handed them back to him and said "They are awesome and probably as 'Fast' as any I've ever cracked" he unwrapped the little blue bows on the handles and I walked inside so I could read them to realize, they were for me. I felt extremely humbled that these special people would go to such an effort to show their appreciation of something I was so happy to do for them and I cannot thank you enough for your involvement in this. You are a wonderful craftsman and your beautiful whips will be used and seen often as I crack them with pride for our beautiful Australia. I am unsure if you are aware or not but we lost one of Australia's finest whip makers and a true gentleman in 'Peter Bondfield' last year and as I sincerely hurt for the loss of him, I also in that moment, worried for the tradition to be lost with the likes of him and am now so excited to see that in your hands, our great traditions roll on strong and true. Thanks again mate, for your fine work and all the very best to you in the future and I hope to be able to purchase some more of your wonderful whips as time goes on as they are truly as good as I have ever seen. Guy Mclean pictured abovewith my whips and friend Josh DeWitt. 15/2/2014 Visit Guy's facebook and website. Craig & Zelie Bullen. Animals all around. Zelie has been animal trainer for many movies including Steven Spielberg's "Warhorse". Craig is from circus background and has trained anything from Tigers to Elephants. Just received the whips today. I am speechless they are the best whips I have ever cracked. They roll out perfectly, the strands are nice and tight. You have done a fantastic job Simon, worth every penny!!!!! 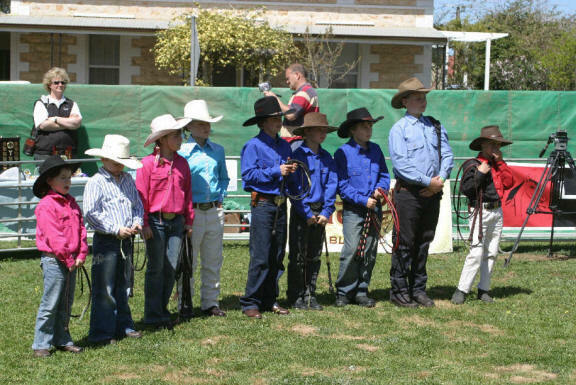 I will highly recommend you to anyone that has interest in this great Aussie tradition. Thank you Simon, your friend for ever. My name is Chris Beck. 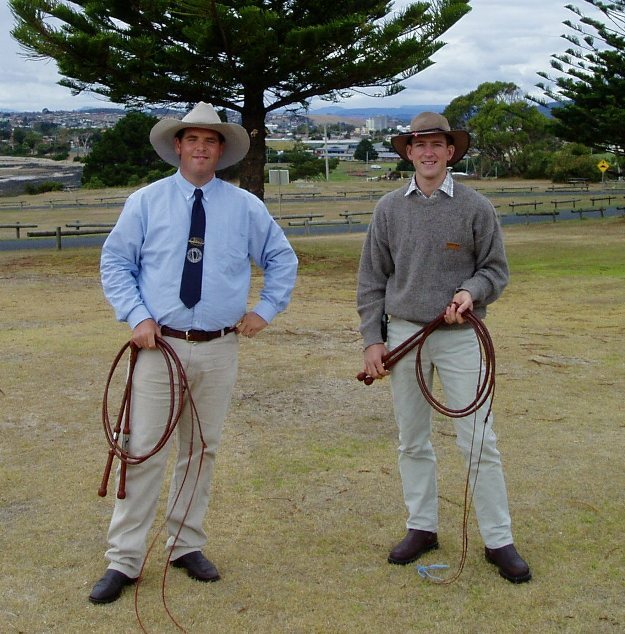 I have been cracking whips in competitions and demonstrations all over Australia for 13 years. In that time I've been in many newspapers, magazines, and TV shows. Throughout that period I won many championship titles in whipcracking competitions including 10 Tasmanian titles, 2 Victorian, and 3 Australian Championships. In those 12 years I had the opportunity to use whips of many different whipmakers around the country some good and some bad, but I choose to use and recommend Simon's whips because I believe the finish and particularly the balance of his whips are superior to any others I have used. I own stockwhips and bullwhips made by Simon and I am extremely happy with them and will continue to use them until I retire. Chris Beck. 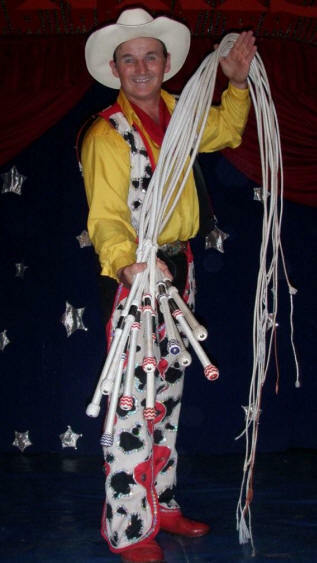 I bought two pairs of Simon's WHIPPA lace whips, an 8 ft pair and a 5 ft pair. I've been using them regularly for my training, competitions, and shows ever since I got them. The WHIPPA lace whips are way easier to take care of than leather and they look great on stage. Thanks to Simon for doing such a good job making them. I got the new thongs and the new set of whips. Great job! They are exactly what I was looking for. Thanks for standing behind your whips and making me an even more satisfied customer. And thanks for the heap of popper string you sent as well. In 2012, I (Simon) was asked to teach Hon. 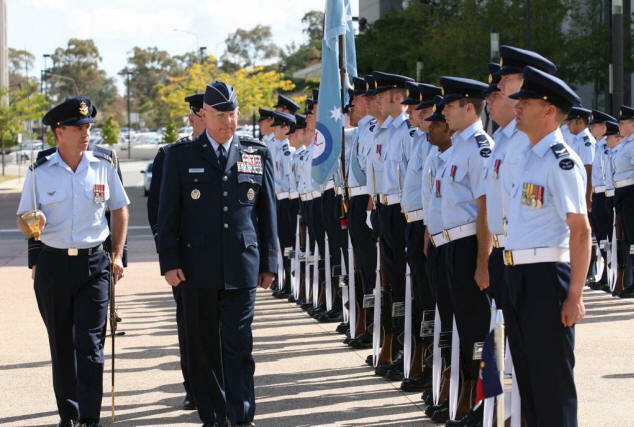 Tony Abbott (now former Australian Prime Minister) to crack a stockwhip, unfortunately they had to end up cancelling due to media issues but Senator Richard Colbeck organized a time for me to present Mr. Abbott with an Australian Stockwhip. I really appreciate is personal letter he sent to thank me. The above picture is of myself and Mr. Abbott with Senator Colbeck in the background. Brooke 11 years, Katie 15 years, and Daniel 17 years. As proud owner of your first stainless steel, laser engraved whips, numbers 42 & 43 I would like to wish you all the best with your business and hope to see your future full of success. To any potential whip owner out there, I highly recommend Simon as the up and coming whipmaker for our generation. Support young Aussie enterprise and get Cracking!! 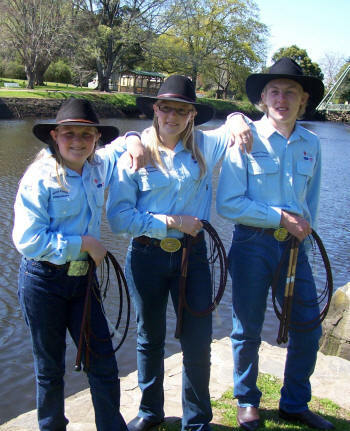 Pictures of some of the "Famous Penola Whipcrackers" back in the late 2000's. 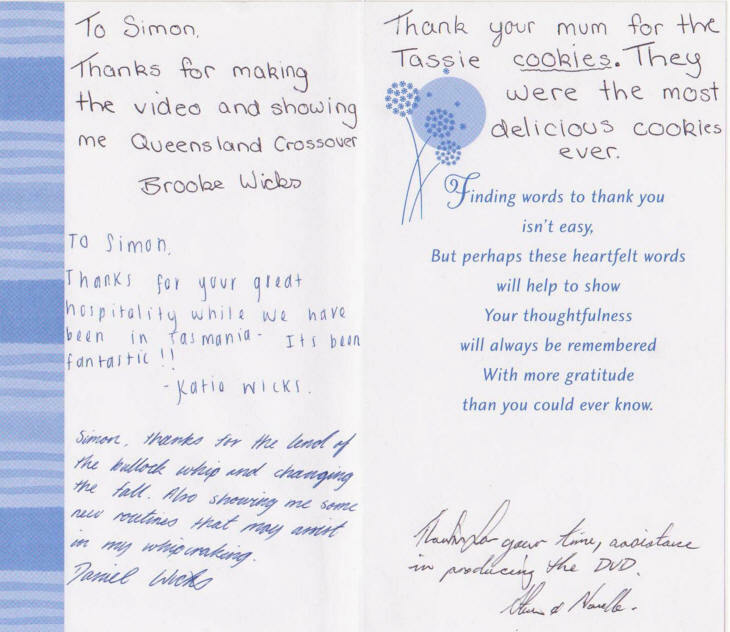 Sorry about the delay in the reply, but I wanted to thankyou for sending us your fabulous DVD. It arrived on Monday 9th April 2007, and I don't think that there has been any other DVD played since then. Our daughter Georgie (9 years) has spent countless hours going over and over different routines and practising them over and over and over. Since we have had the DVD, she has learnt the Windmill, Murrumbidgee echo, train, Drovers Two Steps, Mary had a Little Lamb as well as having a go at creating her own signature routine. Talk about inspirational!! Our son Max (6) has also been having a go and trying new stuff too! They both love the interview that you do with Ben Hughes, Georgie loves the Launceston Special, but is yet to master that one!! Thankyou once again, for providing us with endless hours of entertainment. 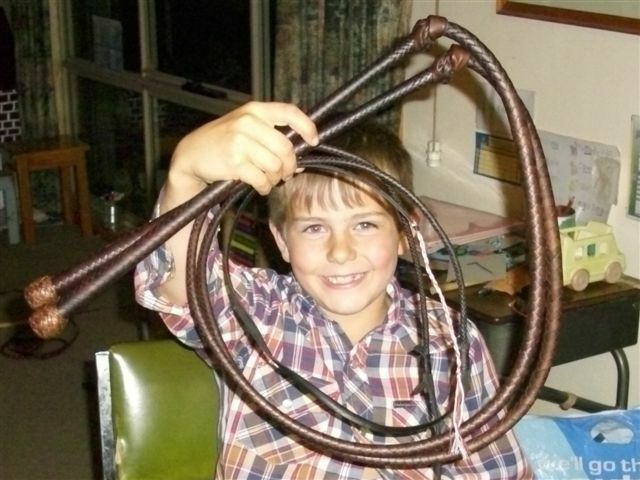 I received one of your bull whips for Fathers Day. I just have to tell you it is beautiful, it is every bit as good as you said it would be. I am more than happy with it, it is better than I could have hoped for. I have warn out a "cracker" already, not to mention one arm. I have no hesitation in recommending your whips, if any one would like to speak with me about my bull whip, I would be most pleased to hear from them. It was a pleasure doing business with Simon. He always replied promptly to my endless questions and gave sensible advice. He was also totally accommodating with my order, letting me customise my whip so that I had what wanted whilst still making me a practical, working whip. Simon is a professional and his whips are not cheap but when you get your hands on one you'll see why. The whip Simon made for me is as good as I could have wanted it to be. The only trouble is I'd like another one now as well :o) Thanks again Simon. Hi Simon! Thank you so much for making the whip I designed, I really didn't think it was A) Possible and B) Actually going to look as good as it does. This is going to be a really great piece to have and everyone who has seen it was very impressed! I plan on mounting it on my wall in the living room, I want people to see it. The fur and suede and everything feels really nice too! You have my utmost appreciation! The Quirt arrived safely today. As I suspected from your web site it is magnificent. A real work of art and exactly what I wanted. You are indeed a craftsman of the highest order. Thank you for your care and attention to my endless wants. Wonderful, wonderful, wonderful is all I can say. My friend who is from Australia will love it. Hi Simon I received my bullwhip today and it is incredible. Very nice craftsmanship. Thank you for the great service and excellent product. My crop arrived today - WOW! Outstanding! I'm very pleased and impressed. The US market is saturated with mass-produced, cheap riding crops and although there are some fine whipmakers here in the US, none of these individuals seem to have decided to add a handcrafted crop to their product line. I am very discerning when it comes to my equipment and I had to go halfway round the world to find something that met my high standards for materials and craftsmanship. Thanks for all your hard work and attention to detail." My new whip arrived today and it is beautiful. The workmanship is excellent. You are very gifted and deserve congratulations. I received the matched pair of stock whips yesterday. They are simply beautiful! I almost hate to dirty them up. These are the second, and third, whips that I have gotten from you so far, and I highly suspect that a fourth is in my future. Keep up the excellent workmanship, it is the best I have seen! Thanks again and best regards. I purchased a whip from another manufacturer that broke. I contacted the maker and wasn’t happy with the results so I contacted you. I was very happy with your truthful answers even though it wasn’t your whip you were a great help. My whip turned up 2 days ago and I am very happy with it. It looks better than I imagined. Well I had better get to work. Thanks Simon, We received your "work of art" this morning. Everyone is very impressed with the quality and workmanship. You have done an amazing job and we really appreciate you meeting the time pressure we put on you. Best wishes, thanks again and I'll be in touch. Sorry I've taken so long to get back to you with some feedback on your Bullwhip No.30. But I wanted to break it in and get familiar with it which has unfortunately taken some time. As you know I was living in London, a big city and not very whip friendly. There are a lot of parks but it's usually not long before people come over and politely ask you to leave. Now I'm living in New York even harder to find some where to go and give the whips a good working out. Ps. And just so you know my bullwhip number is 30, Which without knowing that my parents ended up paying for the whip for my 30th birthday. Just thought that was kinda cool. The whip I purchased from you a few months ago is great. It is now starting to loosen up a bit and is working beautifully. Of all the whips that I own (10) this one is the easiest to crack and do routines with. I don't claim to be any great expert but since using this whip I have improved quite a bit. Hope you are well and busy? I received a couple of your DVD's last week and I tell you what! the kids are loving them! You have done an excellent job and solved a huge problem of ours which was that my husband and I only knew so many things that we could teach them and they wanted to know more. Not only that but they are now expert cracker makers and fall changers and now Dad knows how to fix that whip with the broken strand! 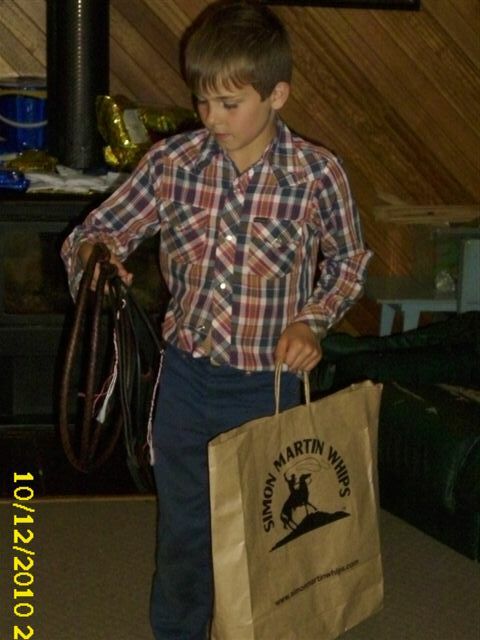 Our eldest boy won his first whip cracking comp this year against about 30 other kids and he was wrapped. They spend a good half hour with the whips most nights and I'm finding that they were a really good investment (for Mum and Dad too). Only thing is that after having watched your DVD's it really highlighted the fact that the cheap and probably quite nasty quality whips that I got for the kids a couple of years ago are now obviously well and truly past their use-by dates and seeing as though the kids are quite committed to them we have decided that it's probably time to invest in some much better ones. Can you help us out? We await your reply. Simon, The whips arrived today. They are lovely. You have done a great job and I am proud to add them to my collection. Thank you for sharing your artistry with me. Just a line to say that the maintenance kit has arrived (and it only took five days!). I’ve got everything I need to get started and now comes the hard, but enjoyable part, learning the art of whip cracking. Once again I would just like to say thank you very much for the time and trouble you took over me and setting me up with a great whip to get started. Hope to be in touch in the future. 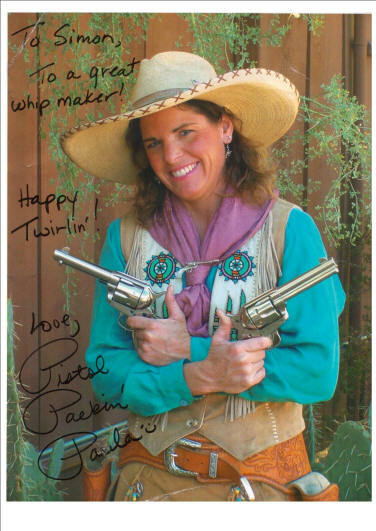 I want to thank you for the Indy whip that you made. I just wish that it wasn't raining so much up here at the moment, as I am really keen to get out and have a crack! I really appreciate how smoothly the whole buying process went. It really makes me want to build up a collection of your whips. I am also very impressed with the quality of the whip. I received the second whip this week. It is beautiful and the workmanship is immaculate. I get many complements. I’ll do what I can to send business your way. Hi, Simon Whips are great. The kids and Danny love them. To quote the kids "they are wicked". They have gone to school today for show & tell. We are very happy with the handle patterns they look great. Keep up the good work. Regards Karen Walker. PS. If are ever in the District the kids would love to catch up with you. I picked the whips up at the post office this morning! Wasn't home yesterday to sign for them :( They look fantastic! I wish I could get outside and play a little, before Devon gets home this weekend, but it's too cold outside, high today is only supposed to be around 38 degrees (I forget the conversion factor, but not much over freezing). Should I dress them with the Pecard's before she starts using them? Should they be supple, or a little stiff? Do they "loosen" up as you use them some? :) Wasn't sure if/how the climate change would affect the leather. AM still debating whether to make her wait until Christmas, there is a tournament in January, and I would like her to get used to them. Thank you again!!! you're the best! Sorry about the delayed response to the new whips, too busy enjoying them. Really pleased with the new whips. Some things I have struggled with for awhile, now seem easily achievable. Even starting to get the four corners starting to flow if not cracking well. Also been impressed with how quickly they have started to loose their initial stiffness. Should be primed now for the SA championships (in what ever format they choose to hold it) mid September. I have a pile of new cracks to share with the kidsfrom down the South East and I hope they have some originals to show me. Do you know the various crack combinations they use with the Hoofbeats routine. I have been watching a video of it and I think I know what they do. Is it just the last two combos that I am not 100% sure of. This seems like a real crowd pleaser and one I would love to learn. Hope your business continues to do great. Perhaps I will order a snake whip in the future to complete my Simon Martin collection. We received the whips safely and much quicker than we expected! Many thanks for going the extra mile for us and being so prompt. The problem is that once I got the whip, I couldn’t wait to give it to Ron and so he has an early Wedding Anniversary present. Of course, he is delighted and he loves the whip – most impressed with “the balance” He’s looking forward to mustering this week! You're the man Simon! I have tested your 8ft, 12 plait, Indy whip now and it's great on top of looking good! Cracks with very little effort and so nice and light. This will surely make practice easier and longer. From the first few goes I could already do the cracks and routines I've been practicing easier compared to my 10ft. I LOVE THEM BOTH THOUGH! Many thanks for being so cool and patient with all my enquiries via email and phone. I've learnt that a whip is a very personal thing and it's a nice thought knowing that the people that have made my whips like yourself are genuine down to earth individuals. It's like eating good food made with love. You can always tell. In this case I know that your whip was made with the same approach! Please feel free to add this email to your testimonials. I truly look forward to meeting you in the near future and seeing your shop and all the cool things Tasmania has to offer! Best wishes for "SIMON MARTIN WHIPS". God bless and guidance. Keep in touch! Just picked up whips at post office, they're exquisite, you are surely a master of your craft. A little wet out right now so I'll wait till tomorrow to give them a try. Really like the way you take care of business and hope to continue in future. I really like these whips, thank you very much. I would just like to Thankyou for that really good competition you put on Australia Day, I had so much fun. Those 5ft whips that you made me are Perfect, they are the Best I've ever cracked and I can do so much more with them. The Bullock whip that you made me is also Perfect, and also the best I've ever cracked or seen, I also liked the name in the handles of all the whips and the colours they look good. My brother was also very happy with his whips. the many questions, and also for your prompt service. will catch up on the road somewhere. again, will be more than happy to recommend. Stockwhip #509 arrived today. A uniformed messenger of the United States Postal Service (Teresa in her Jeep) delivered to my rural abode. Since she is a horsewoman and a barrel racer, I told her to stay for the opening and admiration ceremony. Simply superb, sir! It cracked proper on the first try and I am actively fraying the cracker. I have received the whip - thank you. My friend collected the mail, but held out on giving the parcel to me until Saturday, when it was my birthday. On my first pathetic attempt the whip cracked - I was most impressed. The quality of your work is top class - I will definitely recommend you to my friends. I also liked the DVD - I've watched it quite a bit. God bless you mate, what a fantastic whip. You truly have a gift. It was like Xmas for Jacob. He was up at 3.00am this morning. We made him wait until 5.00. He could not have been happier and the whip has truly exceeded all of our expectations - a work of art. The DVD is great too (we watched it a 5.30am). 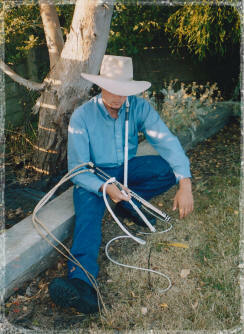 Jacob was out at 7.30am cracking the whip - reckons it cracks easier and louder than his "el cheapo" stock whip. Although, he says he hasn't it warmed up yet. He was practising the Cattleman's crack and the Volley. I tell you, he's is that impressed with the whole package - one very happy kid. The Certificate is up on his bedroom wall already. Anyway, thanks again for a magnificent whip - I'll put you on notice now that he will be wanting a matching stock whip for Xmas (is that a red & black one on the DVD?). Thanks again and I will send some photos through to you soon. They're good whips Simon ,they're extra extra nice, they crack good and they are beautiful Simon . Thankyou so much for making them before Christmas . Hudson has since been a multiple Tasmanian & Australian Champion. Just a quick note to let you know the order (two parcels) arrived yesterday afternoon. Everything was in excellent condition. I am very impressed with the workmanship (and the engraving is excellent) and thank you very much for your all efforts on this - great to know you enjoyed the challenge! Hi Simon, It has now been 1 week since I received my 6ft. 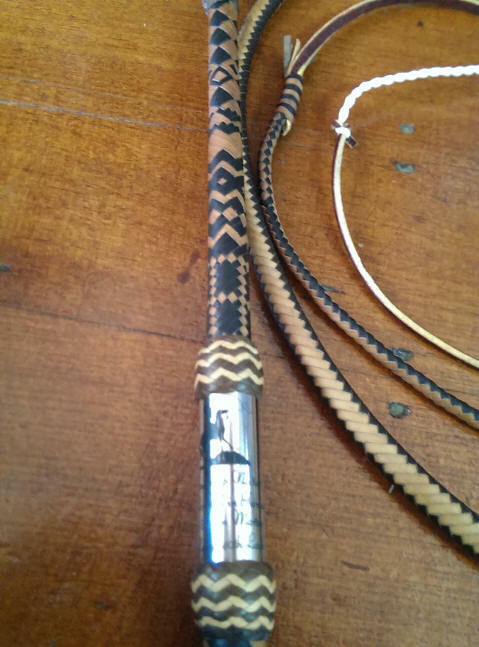 kangaroo hide two tone stock whip. I commented to my wife last night that it has been some time since I purchased something of this value purely for my own satisfaction. I am delighted to have done so as this has added a new interest to my life and maybe a new dimension as time moves on. The quality, obvious even to a layman, is superb and I am pleased to have decided on a 12 plait two tone. It provides pride of ownership over and above the challenges presented in learning the cracking craft. My Simon Martin Stockwhip 'No. 576' is a real beauty. My sincere thanks for the product and the service. Cheers. 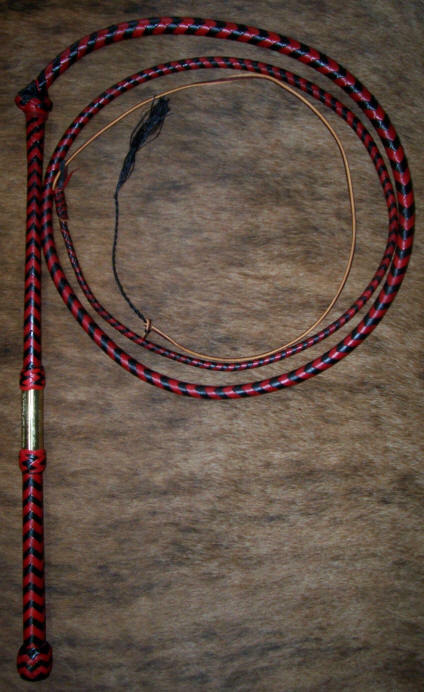 I just received our whip in the mail today. Thank you very much it’s lovely! We will display it in a special place at HQ. Greetings from deepest, darkest Cheshire! You need to have more faith in the ability of Australia Post and the British Royal Mail to deliver my friend! 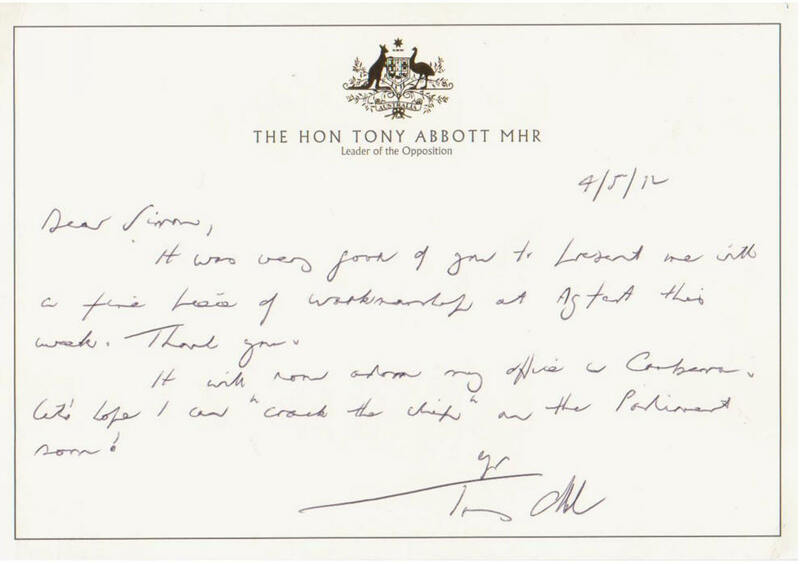 The whip arrived in good condition today thank you very much – with nearly 10 days to spare before Australia Day! Have already given it a trial crack in our very cold, very small backyard here and it falls nicely. Should be quite easy to teach the Poms to do it with this one I reckon! Anyway, thanks again and I’ll try and get some photos for you perhaps of the stockwhip in use over here, if you’re interested? Simon, now that I have had time to really have a look at the 2 signature whips I can appreciate even more the thought you have put in to the design. The "ORS" plaited into the handle has come up very well & I must admit to a bit of concern here. It did not occur to me to run it up the handle & now having seen it, it is an obvious choice. The tread pattern you have incorporated into the base of the handle as well as top & bottom of the ferrule is an excellent touch. The ferrule itself has come up very well with every detail of the logo evident. To my eye the whips are faultless in every aspect, Design, construction, & overall artistic nature. I am compelled again to thank you for your design input & skill in achieving this pair of whips with a minimal design brief. 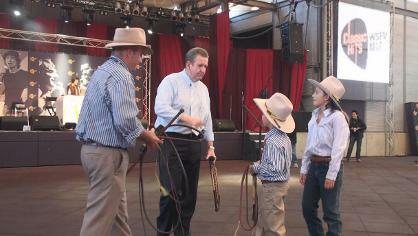 Henry, Georgia and Andrew (father) Pitman present Barry O'Farell (NSW premier) with one of my stockwhips at the Sydney Royal Easter Show. 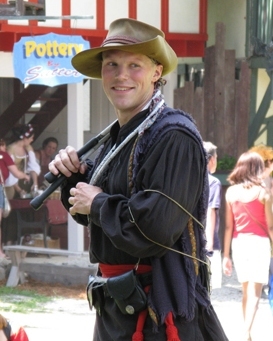 Both Henry and Georgia have been Australian Whipcracking Champions. The whips arrived just before Christmas and were intercepted at the PO, wrapped and put under the tree! They are terrific. The patterns and the plaiting is amazing. They really are a work of art. I was amazed at the fine detail. Thankyou for your hard work. The whips arrived today, I am so very pleased with them! Wonderful, wonderful job on both pairs my friend, thank you. You were right about 5 footers, I'm really going to like that length. Will take a bit if practice to get comfortable with the faster speed, but the volleys take right off with these. I'm really happy with the all black and the plaiting choice on this pair, looks fantastic. Thanks once again for putting together such quality products. I look forward to my next order with you as always! Yesterday I had a serious run day and have seen the package in the evening. I was very pleased. I am very proud of such a good whip to keep my hands. I can see the quality and feel. What I like best, the detail with serial number, that is the point on the i (swiss Phrase) . In Switzerland, we say "Wow" to something. I will gladly order from you again whom it is possible. Hi, I'm Jerome. I got my whip yesterday, and the delivery was superfast. It was lighter than I thought, So I tried attaching a magnet to the handle :) I tried breaking my new whip today. The sound was louder than my 8ft American bullwhip. Thanks for additional fall, oil and crackers. I hope your business grows bigger and bigger. Goodbye. This is just a brief note to say how impressed and grateful I am for the whip that you kindly made for my 40th on behalf of my father. It is an amazing piece of work and you should be very proud of it, as I am to now I own it. 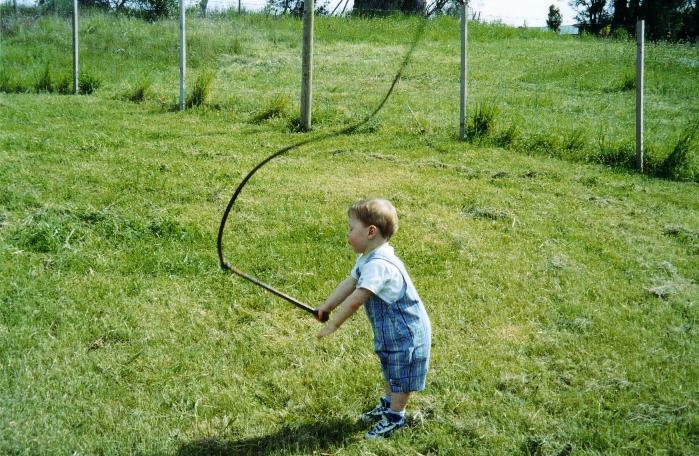 My little boy has been greatly admiring the whip and I would love to be able to get him one for his birthday. Hence my question, do you have in stock and small red hide whip that I could buy? It's his 5th birthday on Tuesday and would it be possible to express post it on Monday so it is here by Tuesday. If all too difficult, I completely understand. Thanks again the whip it is magnificent. The whip is beautiful! ! ! I can't wait to play with it! ! ! Thank you so much. You did an amazing job on it. That is an awesome work of art, and craftsmanship. It was well worth the wait. 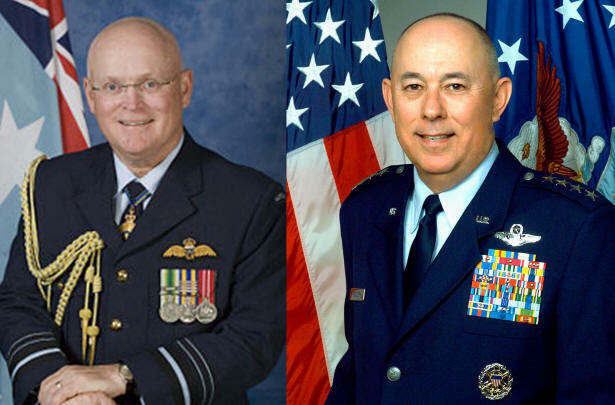 I have been bragging about your work, to my friends. In the future I want you to make a pair of competition stock whips, for me. After all, I am a collector. I have referred you to my friends. So. . . . you will be getting a lot of business, from my end. I am glad that you had a great hunting trip. I am a hunter, as well. When me, and my wife to be, get married. We are coming to Tasmania, for our honeymoon, and we want to meet you, and visit your shop. Once again. . . thank you, and kind regards to you as well. Surprisingly, the whips have already arrived. Although stiff from being new, they still crack with relative ease. I can only imagine that they'll handle even better once I break them in. So thanks for the great pair of whips! How long is your lead time if I had wanted to place an order for a nicer pair(higher plait count) in a different length? Thanks again. I just received the 7ft, 12 plait bullwhip you made and I have to say, it's a work of art! I almost didn't want to crack it but hey, bullwhips are made for cracking and it works beautifully. My hats off to you and I know, with every film set I bring this to, there are going to be a lot of jealous stunt guys and gals that are going to want one. Pics and video are on their way soon. I just wanted to let you know that whip arrived today. I’m ecstatic with the results as the whip is exactly what I was after. I did have one question with regards to the leather balm you included. Are there any special care requirements I should follow to look after it? Apart from that I’m looking forward to being able to go out and give it a crack (unfortunately it was a bit late by the time I got home from work). Should I ever be in the market for another whip, then you will definitely hear from me. Similarly the next time we visit Tasmania I’ll visit your shop. Ps. Hope you enjoyed reading through all this page!